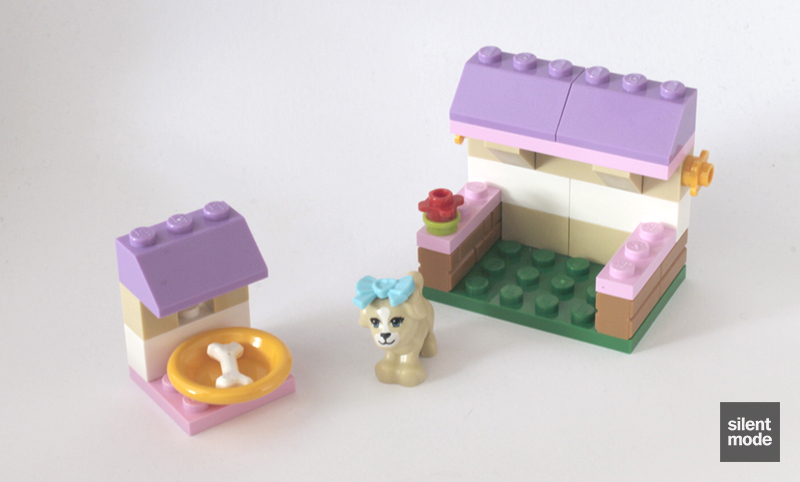 Build the Puppy’s Playhouse and nurture him online! Create a cute little playhouse for the puppy, then help to take care of him! Play on the pink seesaw then reward him with a bone in his dish! When he’s tired, tuck him into his playhouse and pet him until he falls asleep. 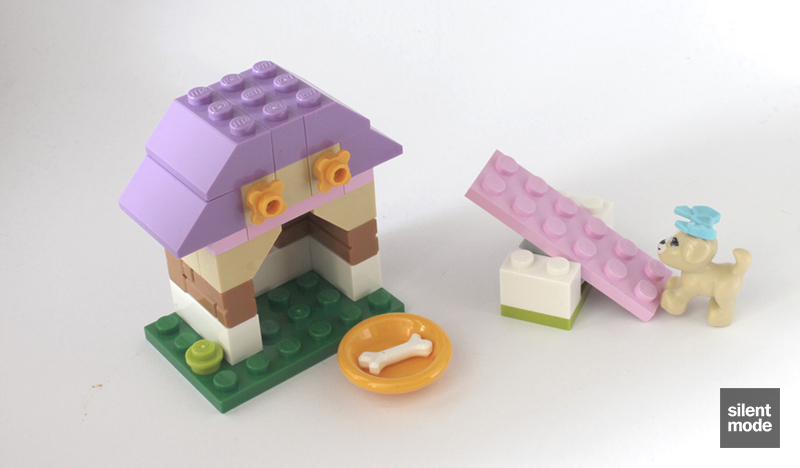 Take care of the puppy online and get lots of building inspiration at LEGO.com/friends! Combine with LEGO® Friends sets 41023 and 41024 to create a bigger habitat or playground for all 3 animals. Includes a puppy figure with bow accessory. 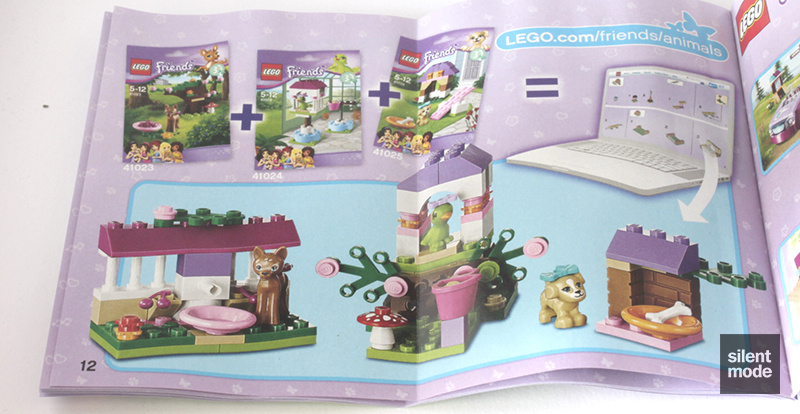 Combine with LEGO® Friends sets 41023 and 41024 to create a bigger habitat or playground for all 3 animals! 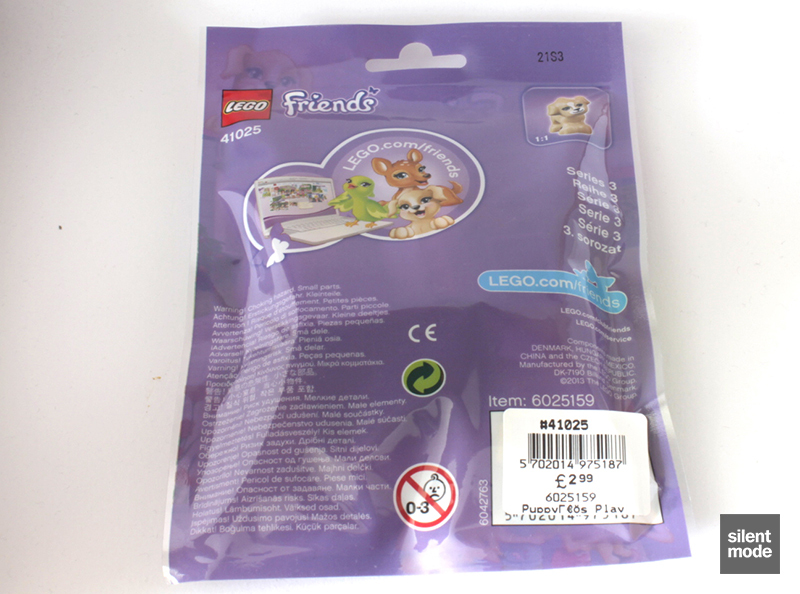 They tried to sneak this past me, but a keen-eyed SilentMode noticed Series 3 of the Friends animals collectibles on sale in the LEGO store yesterday. I’ve got some spare time to review them, even though I don’t have Series 2 (I’m waiting for the prices to come down). Once again the three sets in this series have different set numbers, so they’ll all get their own reviews. LEGO’s decision to put the contents of these sets in tearproof packaging was a very smart move. True story: while looking for discounted Collectible Minifigures in my local Tesco, all they had left were some torn-open packets of Series 10, with some of the parts having been stolen. Absolutely disgusting behaviour, and it doesn’t matter how rare Mr Gold is at that point. Anyway, there’s no real difference between this series and the previous ones in terms of packaging. Another attempt at using curly apostrophes on the barcode backfires. On the front of the packet, tension between Andrea and Stephanie forms over control of the fawn – but it’s all smiles. Comfortably packed inside are a folded instruction book and a single bag of parts. The presence of Medium Lavender is a good sign. Immediately the eyes of masonry bricks fans have lit up, as we have another opportunity to obtain four of them in Medium Dark Flesh. Currently exclusive to this set are the 1×1 brick and 2×3 slopes in Medium Lavender, and the 1×3 and 3×3 plates in Bright Pink. We can also find the 1×2 Medium Lavender brick in Cat’s Playground (41018), and you’ll remember the Red flower plates from Olivia’s Beach Buggy (41010). At present, someone’s completely messed up the inventory on BrickLink, in the name of scoring brownie points. Going by the above description, the puppy is indeed male, and the same mould as the one in Mia’s Puppy House (3934). Unfortunately he has to undergo the trademark emasculation process by having a bow placed on his head – it’s optional, but once you do it there’s no turning back. Everybody knows that dogs love bones, so that’s what we’re going to feed him. As anyone would, my first thought was this being a see-saw – but with no seats or handles, we can tell it’s a ramp. The puppy would run up the ramp and come crashing down to earth on the other side. A very simple build with five pieces. Again LEGO steps in to remind our young builders to take matters into their own hands, should an asteroid collision be on the cards. Peewee Herman is nowhere in sight, but that doesn’t stop us beginning construction. 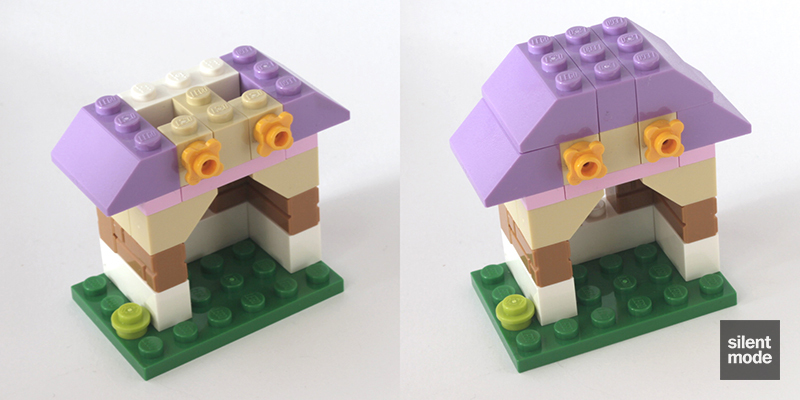 You can see how the 3×3 plate is used with the 1×3 plates to create a 5×3 roof, which may come in handy for microscale builders. The gorgeous roof is constructed with the rest of the bricks, though I’m wondering why two separate bricks were used instead of a 1×3 brick. Perhaps it’s because the 1×2 brick in Medium Lavender already existed. The Bright Orange flower plates are attached to the 1×1 SNOT bricks in Tan. That’s all there is to it, but we shouldn’t expect much from a 32-piece set! At least we have something to keep the puppy occupied. Puppy’s Playhouse has the most spare parts in the series, and in my view the two spare flower plates are by far the most useful. 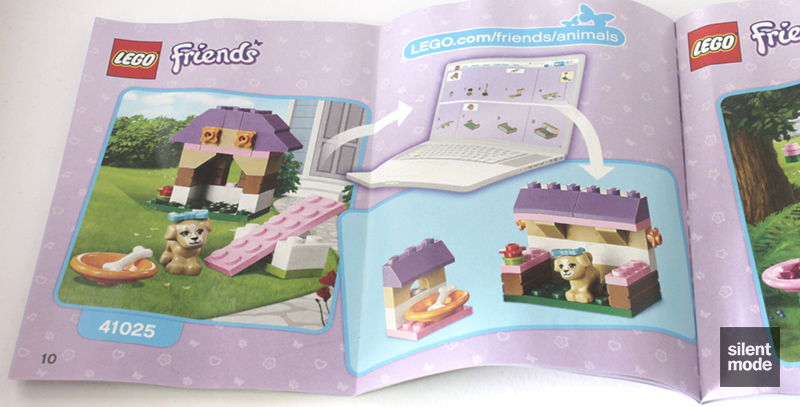 Instructions for alternate builds using the different sets can be found on the official LEGO Friends web site, by visiting LEGO.com/friends/animals. If you’re a pro builder like me ^_^ you can figure out how to build the alternate model without instructions. And like with the previous series, you can combine all three sets to form Voltron… or rather a bigger set where all the animals can hang out. Unfortunately the puppy was given a raw deal. 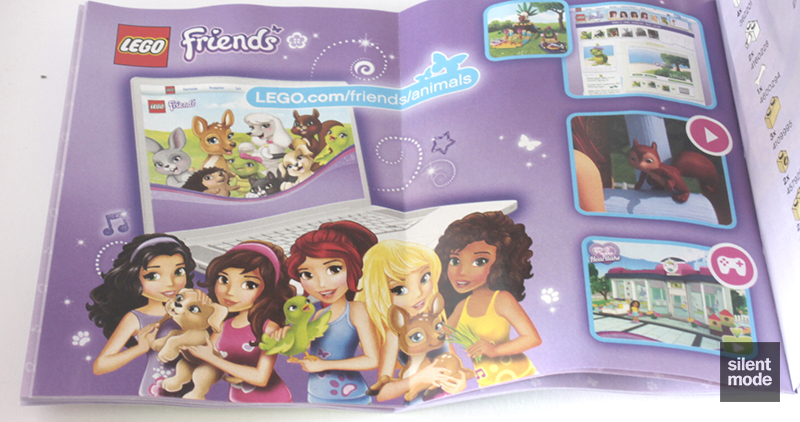 The very back of the instructions shows another advert for the LEGO Friends web site, in particular the animals section. We’ve had Psycho Dog; this time around, introducing Suspect Squirrel. For some reason I ended up with two copies of this set, when I’d meant to buy one of each. No matter, because this is a particularly attractive set for parts. 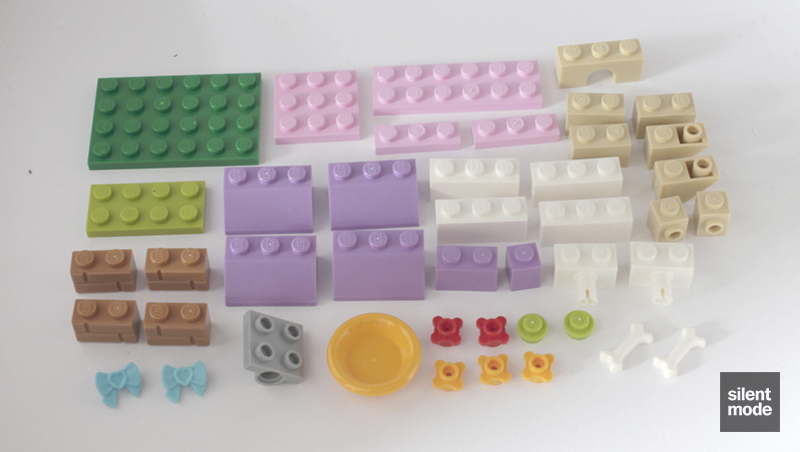 The Medium Lavender parts (especially the bricks) and the masonry bricks are definitely worth getting the set for, and the set itself is a very easy build. Understandably the puppy is a re-colour of the old puppy from the first wave of Friends, and probably won’t be interesting to anyone unless they’re on a mission to collect all the animals. It’s still better than that daggone kitten from Olivia’s Tree House, but I would have liked the one from Stephanie’s Soccer Practice (41101). On closer inspection the playhouse is near identical to Mia's Puppy House! But at least they've used a different selection of parts, so I won't call shenanigans too loudly. A very simple, almost foolproof build; you could almost do it without the instructions. Really liking the presence of Medium Lavender parts, masonry bricks and other potentially useful pieces; not so keen on the puppy. There really isn't much to do with this set unless you add other pieces, animals or minidolls. There's only so much one can do with the ramp. Would definitely recommend this over Mia's Puppy House, and worth looking out for if and when discounted for the parts. At the end of this brief review, I’m giving the puppy 6.0/10. It should be in toy stores near you now. Look out for reviews of the other two animals in this series, very soon! Gewinne!th knows how we do.